On April 17, I was lucky enough to attend a Patient Navigation Conference hosted by the Connecticut Cancer Partnership. Along with Marie Yardis, the EDP coordinator at CHC and Corazon Irizarry, a fellow AmeriCorps member, we spent the morning listening to Rian Rodriguez speak about how patient navigation has evolved over the past twenty two years. For me, the concept of patient navigation is very new but was made easy to understand why there was such a high need for a program like the one started in 1990 by Dr. Harold P. Freeman within the realm of cancer treatment and under-served populations. Rian spoke of the time he spent working with Dr. Freeman and displayed the alarming statistics from the start of the program; they showed the significant barriers many poor populations were facing when it came to seeking cancer treatments. Rian Rodriguez was named the Director of the American Cancer Society two months ago, and although he is fairly new in this position, he has been working side by side with Dr. Freeman for almost two decades. In 1990, the pioneers of the patient resource movement, started to track cancer patients within their different stages at Harlem Hospital. They developed mechanisms to systematically track the patients and figure out how to remove the different barriers different patients were facing. Some of the barriers that were discussed in the breakout session I attended had to do with finances, transportation, cultural differences, race/age biases, fear, and the overall healthcare system the patient was involved with. One solution they came up with to help eliminate at least a few of these barriers was creating the role of a patient navigator. A patient navigator is a resource that can be assigned to patients to help them tackle the many issues that not only cancer brings, but issues that arise from people who do not have access to basic health resources such as insurance or proper information. 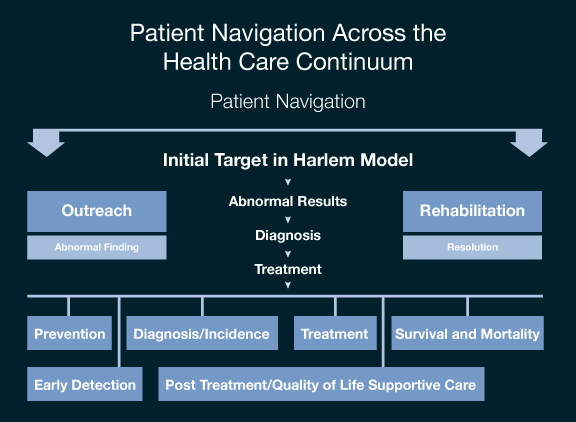 At a point when patients and their families are facing the challenge of their lives, they must navigate and manage one of the most complex healthcare systems in the world; the patient navigator serves as sort of the tour guide during this intricate process. The model of Patient Navigation is pictured below. Most people are aware that almost one in four people in the United States do not have proper health coverage. Without adequate health insurance coverage, many people seek preventive cancer care and treatment too late, which results in a shorter span of time to actually fight the disease or to even evaluate the patient’s options. When patient navigators are involved, they can help promote practices such as early detection which can help discover abnormal results sooner rather than later. In the chance that a patient is found to have signs of cancer, the navigator can then lead them in the direction of diagnosis, treatment, and post-treatment. The creation and evolution of this navigation process was proven highly successful after new statistics began to show more cases with earlier detection and less associated deaths within each cancer stage. The model has been altered, and since the field of patient navigation is still developing, there are different and competing models emerging but the overall concept remains intact. Overwhelming populations of people were suffering from cancer health disparities and although the model cannot fix every health system problem, it is doing a good job generating awareness as well as identifying and eliminating obstacles. During Rian Rodriguez’s overview, he discussed three major factors that have improved the percentage of patients helped with the assistance of patient navigators. With an increasing number of patient navigators, free early detection screenings, and a large increase of outreach navigation, the low income populations have been able to improve their battle against cancer and its healthcare barriers. The conference really opened my eyes to the field of patient navigation. As I already mentioned, the program is still developing and changes to meet different community needs, but there are a few things that have been proven for sure when it comes to utilizing professionals as navigators. The key benefits are more lives are being saved, barriers are being eliminated, and the model can be altered to fit the many different communities and institutions to focus on what that specific demographic needs. One of the most important things I heard during the conference is that every individual, family, culture, community and institution is unique. Unique situations call for unique solutions. Cancer patient navigation can be provided by a professional such as a social worker or nurse, or by a peer who is trained and supervised by a professional to work with patients navigating the health care system. At the end of the day, all that matters is that a patient feels like someone is giving them the specific attention they need to take on the strenuous battle against cancer and I am more than appreciative for the impact the conference had on my patient navigation mentality.